Add a little Wookiee to your walk with these adorable Chewbacca Slippers! Star Wars footwear features Han Solo's right-hand walking carpet. Just what you need for lounging around the Millennium Falcon or your house. Step into a fuzzy pair today! Add a little Wookiee to your walk with these adorable Star Wars Chewbacca Small Slippers! Let one of your favorite Star Wars characters keep your tootsies warm on those cold winter nights with this Star Wars footwear that features Han Solo's right-hand walking carpet. These fantastic Chewbacca Slippers are just what you need for lounging around the Millennium Falcon or your house while you proudly display your love for that wonderful Wookiee. 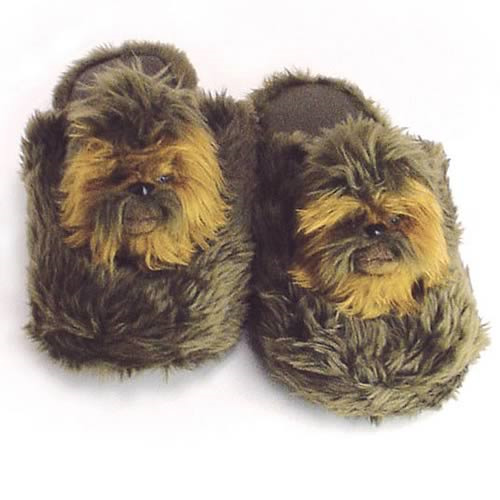 The Star Wars Chewbacca Slippers are available in sizes large and small only. Step into a fuzzy pair today! Small: Men's shoe sizes 7-8.